Blackhawk's Sportster line of rifle cases offer quality on par with the highest quality competitors, all while staying affordable. 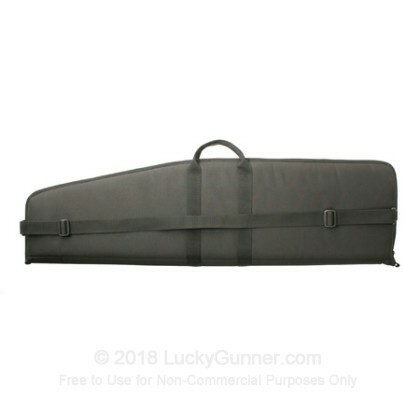 This rifle case, is constructed with heavy duty 600 denier nylon with a PVC laminate for added strength and durability. The over-sized self healing zipper and double rows of locked stitching ensure that the case will be a companion for many years. 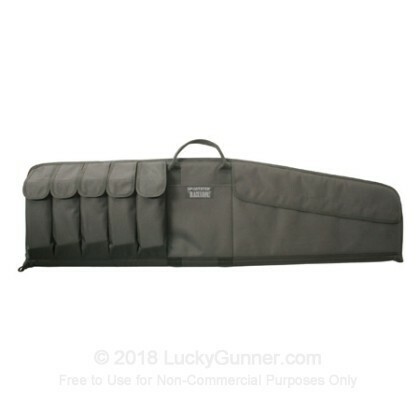 Each rifle case is outfitted with five magazine pouches that will fit AR-15 magazines and two large accessory pockets. This case measures 42.5" L x 12.5" H x 3" D.
I found this by happen chance...reviewed the clearance section and saw the price and thought way too cheap right? I read the reviews and everyone was saying this was a great buy and they were all shocked with the quality of the material and the workmanship. I ordered two of them and they were delivered to my work....Everyone was shocked including myself on the what I received! The first thought was wow, they must have shipped the wrong cases because these babies rock! I double checked the part numbers and they were right on. These gun cases are unbelievably fantastic! I will be back for more products in the future! Nice case at a fantastic price. Fast shipping and great service. I bought 4 of these cases. Wasn't sure how good they would be for the price. I was pleasantly surprised. The padding was excellent, the materials are all high quality and it works great! Don't be afraid to buy these! Blackhawk tactical case has great quality and value. I saw these one sale and bought three. Should have bought more to give my buddies. I know they are going to want some also. Case has a lot of room for mags and cleaning gear. Will make a good bug out case or just a stow and go bag for trips to camp or a range. They offer good protection for the guns and are pretty well build. Buy and be happy. Ordered (3) of them and they were sent promptly with no problems. Cases are just as described and work perfectly. Can't beat the price!!!. Only thing I noticed is that the zipper closes right at the rifle barrel and there is nothing to prevent the zipper from opening a bit allowing the rifle barrel to poke out the opening if the case is tilted forward, jiggled around and the rifle slid down. Would be nice if it had a velcro tab that secured the zipper tab from opening or a small flap inside to keep the barrel a little more protected and prevented the barrel from slipping out if the zipper did open a few inches.... but hey, I'm not the engineer that designed it. All in all its a great case for the money and I don't think the zipper deal is a problem. I actually tried pretty hard to get the barrel to poke out... more than normal use would. Remember the old Samsonite luggage commercial that had a Gorilla beating the hell out of the suitcase?? Same situation. this case is top notch and i'm glad i purchased this when it was on sale i could not be more pleased with it great quality perfect for my AR and a great price. I bought three of these and don't regret the purchase even the tiniest bit. I use them for transporting and storage of firearms, mags and a lite cleaning kit, pens, gun book. They are low-cost but exactly what I expected. I particularly like the mag pouches and larger pocket on the outside which many of the low-end products don't use. I have packs and bags from Condor, Maxpedition and 5.11 but these have a place in my gear assortment. I recommend them and would buy them again in a heartbeat, might buy a couple for my sons for gift-giving occasions. The case is built well and handles my AR perfectly. Ended up buying 2. Got two of these on sale. As good as you'll find in a store for $30 or more. I do wish it had two zipper pulls instead of one, just in case one gets stuck. Otherwise, a great case. Blackhawk stuff is usually sturdy and well put together. For the price this case is GREAT. 5 magazine pockets, a smaller one in the middle and larger velcro pocket towards the front of the case. LuckyGunner comes through again. Placed my order one afternoon and received it 3 days later. I have ordered many times from LG and every time its without regret!! Thanks LG for great service and great products. I ORDERED 6 AND EVERY ONE IS WELL PUT TOGETHER. Don't let the price fool you . Very good blackhawk case. well made, good quality for the money, well thought out. Not sure about them in the beginning before ordering. Was on sale so deceided to try a couple out. Glad I did. Fits my AK and M4 very well. love the 5 mag pouches even the AK47 mags fit well. extra storage on front was a plus too. Durable. Since this order I have ordered 3 more. Great Buy! Outstanding value. A good, well functioning case at a very reasonable price. Fits three mags with Velcro closing, misc. pocket. A very good buy! GREAT PRODUCT -- LOOKS GREAT - FOR PRICE WELL WORTH IT !!! Nice case, fits AR with mag holders, great for the range or just packing out to woods to shoot! Great bag at $20, wish I had bought more! Case is exactly as advertised. Seems to be of great quality and performs exactly as you would expect. AK 47 and AK 74 mags. Nice padded sides. Sturdy zipper. Good handles. Buy them, you wont be dissapionted. I have a few better quality, higher priced cases like these but I bought 3 of these just to keep new-built ARs in. I didn't expect anything great for $15 each. Turns out they're pretty darn good. Good materials, good quality velcro on the pocket flaps which is where the cheapos cases really cheap-out. The handles are really good and stout, well anchored, wrap all the way around the case like they're supposed to. The zipper is smallish, I like the bigger more robust zippers but this one seems to be of good quality and works 100% so far. I tried to find some reason to "bust" on this case and tell my brother's "well it's only 15 bucks". However it is perfectly qualified for it's purpose, store and carry around your MSR together with a few mags,.... 2 of my brothers ordered 3 of these each the next day. Great product at an even greater price. LuckyGunner makes it extremely difficult to pass on a sale item. Something I will have to work on. Have made several more purchases since this one. I will become a frequent flyer here at LuckyGunner. These were on sale do I picked up 6 of them. AR mags fit 100%. AK mags are a bit more snug for a 90% fit. HK/CETME mags fit but they're a tight push. But I was surprised that even my CETME fit in this case! 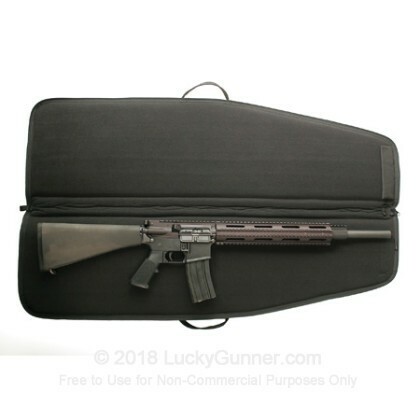 I would recommend this case for anyone with a tactical rifle with an 18" or shorter barrel. These were really meant for 16" or shorter but since I got my 18" CETME to fit I might need to order another case or two!